Leggings are one of the unavoidable collections in any girl’s wardrobe. Even though a lot of other fads have come, leggings still remain in great demand. A pair of black leggings is all that many of us need for a week. But many of us do not know the right way to wear leggings. Wearing the write size of leggings is very important. It should not be too tight or too loose. Make sure the leggings you wear fit your body snugly without tracing the body shape. But too loose can make you look sloppy. You can still wear ill-fitted laggings if you wear tops that stretch below your hips. To get the right size, you can measure it yourself or get the measurements done at the store or from a professional. It is important because the sizes can vary with brands. So, you need to know your right size. If you are in between two sizes, you can buy the smaller size. For example, if you are between L and M, then you can choose L. Else you can try both of them and buy the smaller size. Leggings come in various lengths. You can choose one depending on what you are going to wear with it. They reach below your ankle and most of them have soft pleats near the shins, depending on your height. Usually you wear them with long Indian kurtis, tunics, flowing boho tops etc. In winter you can also wear boots with these leggings. These are best paired with short tops. It may not be a good choice for a formal occasion, but good for all other occasions. They reach till the calf muscle. So, the focus is there. If you are not very confident about it, you can choose to wear the ankle length ones. These are regarded as the sexiest of all. You can pair them with anything, like slip dresses, jackets, tunics, capes, coats and so on. All kinds of footwear also go well with these leggings. These leggings are ideal for workouts like yoga, gym, hiking, walking and running. You can also wear them when you travel. Stir up leggings are also back in fashion. You can style these with anything. Printed leggings add a zing to your outfit. But you should try them on before you buy them because Even though they may look great on the hanger, they may not look good on the body. Choosing them depends on your body size and type. With printed leggings you should wear plain tops. You can try bold and contrast colours. Stockings are worn to cover your legs when you wear skirts and dresses. They are not leggings and cannot be worn as leggings. These are worn when you workout. Most common fabrics for leggings are cotton and lycra. Leather and suede are also seen. They are very stylish. Initially leggings were white, black or off-white. Then leggings in various colures came up. Even contrasted and neon coloured ones came up. They are fun to wear, as long as they do not go overboard or outlandish. Wear leggings with long tops. It should be at least a little below the hips. When you choose leggings, give attention to the fabric you choose, the length, and the print of the leggings. When you buy printed leggings, you have to keep your body type in mind and choose accordingly. Get a professional fitting done. Treat leggings like jeans or trousers. Wear them with crop tops. Wear leggings that are too tight or too loose. Mix printed leggings with printed tops. Wear thongs or thick underwear. Leggings at work – How to wear Them? Some offices have strict dress codes. In this case you can try something called tregggings. These are trousers+leggings. You can pair them with your work shorts, tops and so on. Some offices are more lenient. If you are working in such an office, then you can wear leggings. But the top you wear should be flowing and below the hips. It should not bring any unnecessary attention to the lower part of the body. If you are choosing printed leggings, make sure that the prints are small, subtle and not very noticeable. One of the best things with leggings is that you can wear any type of footwear with them. From flip-flops and pumps to winter boots and ballerinas, all match well with leggings. The only exception is gladiators and strap sandals. They may look awkward when worn with leggings. Nowadays you get leggings specially made for workouts. 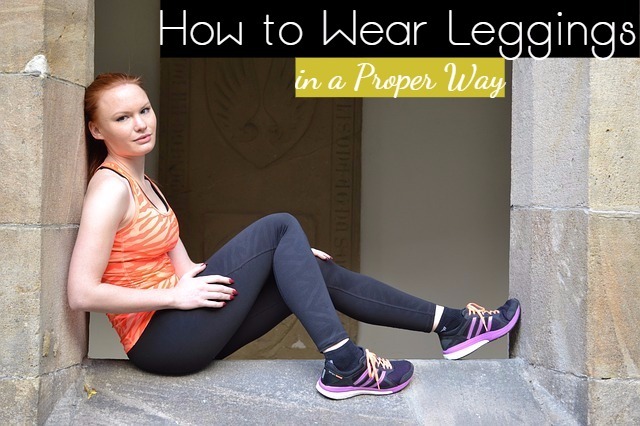 You can also wear the regular knee length leggings when you workout. Whatever you wear, make sure that they are made of good quality and not see through, as they can look very awkward when you do all the physical activities and are being sweaty. Leggings in winter – How to Master Them? Leggings are of great use in winter. You can wear them with cashmere sweaters or jackets, hoodies, or team them with boots. Fleece leggings can be worn in very cold countries. How to wear leggings in summer? In summer you can choose soft fabrics like lycra or cotton. You can wear them under dresses and skirts. Wear sleeveless tops or any other tops with ankle and knee length leggings. If you are in the plus-sized category, just make sure that the problem area is well covered by the top you wear. Usually the problem area is from below the abdomen to the thighs. A lot of layering can add definition to your top. There is no age limit for wearing leggings. Remember to stick to dark colours. Black is the best choice. You can wear any outfit you want, irrespective of your age, body type or figure. What is needed is that you are comfortable with what you wear and carry them well.